What do we lose as we gain more education and experience in yoga? Most yoga teachers I know spend a lot of time perfecting their craft – they read a lot, attend workshops, experiment in their own practice and teach many classes. This means that each one of us is gradually accumulating expertise and ever-more complex knowledge about yoga and the human body, which, we expect, should make us better at what we do. It turns out though, that more education and experience is not enough. According to Atul Gawande, a surgeon, professor at Harvard Medical School and bestselling author, “the volume and complexity of what we know has exceeded our individual ability to deliver its benefits correctly, safely, or reliably. Knowledge has both saved us and burdened us”. (1) Now, the knowledge that a yoga teacher accumulates is vastly different from that of a surgeon and usually does not involve the matters of life and death. But yoga teachers also need to know how to APPLY the vast knowledge that we have appropriately, taking into consideration things that we know about each individual student. When you are juggling many complicated things in your head – your student’s report, your own observations, research you conducted, your experience with similar things, different yoga models that might be applicable, and so on – it’s easy to forget the basics. 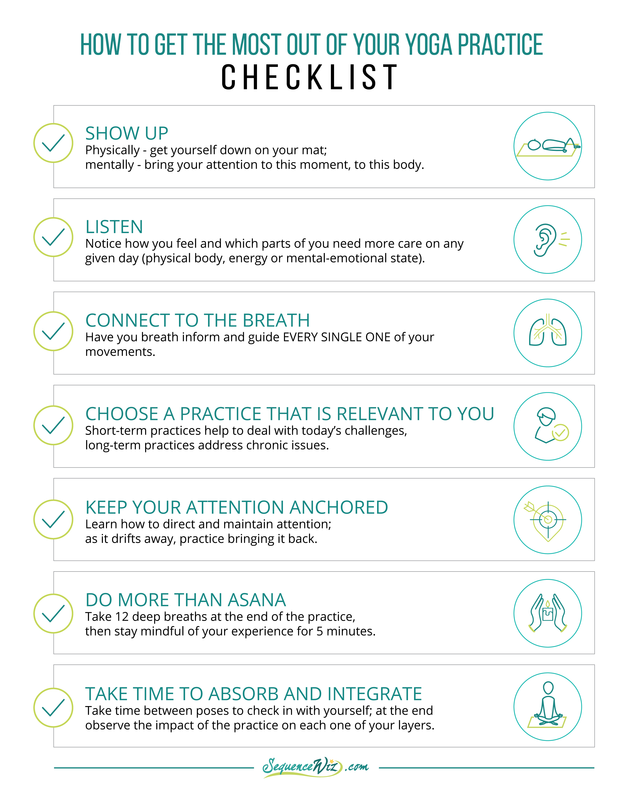 Whether you are trying to come up with a treatment plan for one student or guide a room full of people into a difficult pose, it’s easy to forget about the breath, for example, or just skip it as not important. Yet any complex instruction has to rest on the foundation of the basics. So two main difficulties that we face as yoga teachers are forgetting about the basics, and/or skipping them as unimportant or repetitive. Yet in a yoga practice foundational things like breath regulation and internal awareness are essential. In fact, they are MORE IMPORTANT than mastering a difficult pose. These are all the things we know and take for granted, yet they are not obvious or “second nature” to our students. Our students need to be reminded of those things over and over again, until they become an inseparable part of their yoga experience. And there is a surprisingly simple solution to make those basics “stick” – checklists. In our case higher performance means a more effective and impactful practice for a yoga student. first physically – literally getting yourself down on your mat, and then mentally, bringing your attention to this moment, to this body. Instead of allowing your mind to make all the decisions, listen to your body. Notice how you feel (keeping an open mind) and which parts of you need more care on any given day (physical body, energy or mental state). Throughout the practice consistently check in with yourself – how does this movement feel, how am I doing, where does my mind go, and so on. In yoga we give lip service to deep breathing all the time but then somehow lose that connection halfway through the practice. Instead have your breath inform and guide EVERY SINGLE ONE of your movements. Breath is the most direct link we have to our physiology, specifically the balance between the sympathetic (‘fight-and-flight”) and parasympathetic (“rest-and-digest”) systems, which means that by regulating the breath we can literally change how we feel. 4. Choose a practice that is relevant to YOU. Depending on what you are trying to accomplish, you might have short-term and long-term practices. Short-term practices address your current physical, energetic and mental-emotional state. Those practices can be completely different from day to day. They are most effective when you are trying to maintain a stable body, consistent energy and clear mind to deal with today’s challenges. In a long-term approach you would do the same practice for an extended period of time (days or weeks), tweaking it only slightly. This is done for the purpose of addressing chronic issues that usually do not get resolved in a space of one practice. 5. Keep your attention anchored. 6. Do more than asana. Asana (yoga poses) is great and can serve all kinds of useful purposes. But it simply is not enough for a well-rounded impactful yoga practice. Working with your breath and your mind is just as important (if not more). It doesn’t need to be anything complicated or intricate. 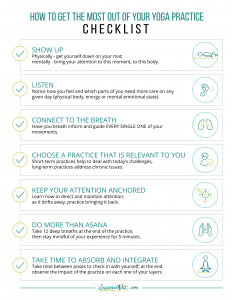 The simplest way to include other elements in your practice is to take 12 deep breaths at the end of your practice (using pace or technique that is connected to your overall theme), and then stay mindful of your experience for 5 minutes (keeping your attention anchored on how you feel). You can go further, of course, and arrange your entire practice around breathing or other yogic tools. 7. Take time to absorb and integrate. Don’t be in a rush. Take time between poses to close your eyes and check in with yourself. At the end, don’t just jump up and run to the next thing. You can use Savasana or any comfortable seated position to take time and observe the impact of the practice on each one of your layers (physical, energetic and mental-emotional). This will deepen the effect of your practice and will give you valuable information on whether or not it worked for you (which you can use moving forward). In this complex and ever-changing world it is always good to get back to the basics and celebrate yoga’s ability to get us in touch with ourselves. In the long run this has more impact then looser hamstrings or mastery of difficult poses. You are welcome to print this checklist and put it in your practice space to remind you of the most important basics. Thanks Olga, very nicely done. Just posted for my students. Great work Olga, as always. At what point do we as teachers begin the journey into jnana yoga? This is a great article and so relevant as people feel like that must get more and more education to be relevant. I am going to pass this on to my YTT 200 students. Thank you so much for your articles. I encourage all my students to subscribe to Sequence Wiz. Dear Olga, your posts are always valuable and insightful. I discovered yoga in the 1960s and have been teaching since the 1980s. Posts such as this bring us back to the “heart of yoga” at those times when we become busy and lose our sense of priorities. The effects show up quickly in our lives, relations, health, etc. A great way to come back home to ourselves for self and students. Thank you Marilyn – I completely agree! Hi Alexander! I don’t see it as paradoxical – after all, yoga teachers are yoga practitioners as well. There is this thing called “the curse of knowledge” when we know so much that we loose sight of the basics. That’s why most Eastern traditions emphasize “the beginner’s mind”. So all those items on the checklist are certainly applicable to everybody who practices yoga. Thank you for reading! Perfectly articulated. Thank you – again. This is a wonderful checklist Olga and i thank you for your constant generosity sharing so much helpful information and guidance. Hi Olga–I just learned about your site and its wealth of information. Thank you! In my opinion, the greatest hurdle that comes our continually educating and refining our knowledge base is this – an increasing detachment from beginner’s mind. Beginner’s mind is a Zen concept that describes an open state of mind with no preconceived ideas, positive or negative. This is a nearly impossible state for any highly education practitioner of any discipline to achieve – essentially, it is imagining ourselves as beginning students, and with it, beginner’s bodies. Talking in yoga teacher ‘speak’, projecting our own bodies capacities onto our students, becoming too enamored with the complexity of a sequence – these are all examples I’ve seen of what can occur when teachers become too entrenched in the intellect and lose sight of being objective, neutral observers of students, i.e. people.